I favor discrete effects loops on rackmounted shelves, since I’m not a stomping-on-stage kind of guy. 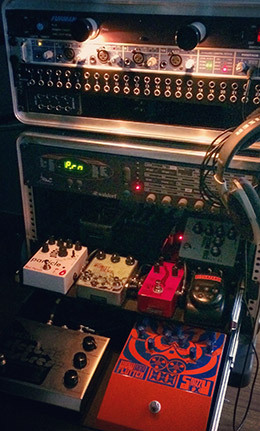 As evidenced by a few recent posts here on Noise Jockey, I think the most exciting way to use guitar-oriented effects pedals is thinking of them as modular synthesizer units. (Indeed, it’s no accident that many boutique pedal makers are now issuing Eurorack versions of their stompboxes.) My workflow usually involves recording signals dry, then running them through the effects as sends. This gives me maximum control when composing, designing, and mixing. I keep my pedals in two distinct loops: One for sculpting and distorting tone, and one for filtering and modulation. However, just sending signals out to pedals as effect sends from an audio interface doesn’t always work very well. Most effect pedals expect guitars at their front door, not synths, virtual instruments, samples, or field recordings. Most guitars with passive pickups, of course, are high-impedance instrument-level signals, not low-impedance line-level signals that one would expect from hardware synths, virtual instruments, or pre-recorded tracks that are coming back out via an audio interface. This can mean that the effect return might be extremely low, distorted, or noisy/hissy, depending on the signal and what specific pedals are in the effects chain. So, there are basically two ways to address this problem. Use pedals that natively support line-level signals. This usually leads one to higher-end pedals like the Moogerfoogers, and they can be expensive. Rackmount multi-effect units often handle line inputs just fine, but many of those units are also expensive and, in my experience, lack the character and flexibility of a more modular approach of individual pedals. My bigger issue with this approach is that it seems silly to limit one’s creativity based on the vagaries of electrical engineering. Use a device in the effects chain to properly match impedances of the sent signal to the effects in the chain. This approach gives the designer, artist, musician, or engineer the best balance of creative freedom while correct managing signal level to optimize frequency response, gain, and noise levels. DI (direct injection) boxes won’t solve this problem, since they usually output at microphone level – still a high impedance signal. No, dear friends, what you really want is a re-amping device, a box that takes any pre-recorded signal and sends it to a guitar amp or effects chain as a high impedance signal. These are as expensive as decent effect pedals themselves, but worth their weight in gold to treat your audio right and send any signal to any effect. A most egalitarian piece of electronic equipment. Many reamp devices exist, even as 500 series modules! But remember my two-loop effects chain? Ostensibly I’d need a re-amp on each chain; that sounded expensive. Or so I thought, until I discovered the Pigtronix Keymaster. There is no impedance, only Zuul. 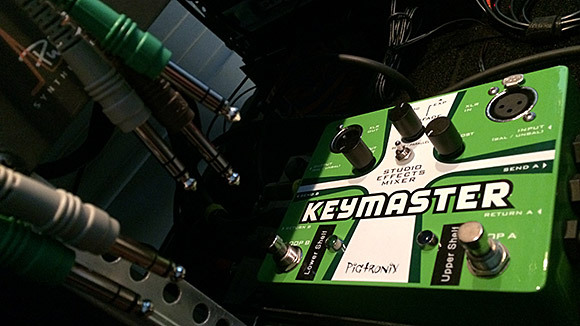 Besides the obvious bonus of being named after a Ghostbusters reference, the Keymaster has two dedicated re-amping loops, each with a send and return and individual loop output gain knobs. PERFECT. Heck, it even sports XLR I/O for the fancy lads and lasses. As an added weird bonus, it actually has a crossfader between each loop, should one want to switch between the two in real time. While I have used this myself musically, most of the time this large green and white box stays in the back of my effects back near my power supply, silently channeling and impedance-matching my dry signals into mangled layers of noisy glory. Many other re-amping boxes exist, and single-channel units are cheaper, but for maximum creative weirdness and flexibility, the Keymaster has become the core of my externalized sound design and musical effects chain, even when it’s simply a silent partner in making noisy things happen. Heck, it even lets me run them in serial or parallel, and freed up some I/O plugs on my patchbay and audio interface. So, if you’re interested in experimenting with effects pedals and stomp boxes as external effects devices, grab a re-amping box and hit eBay or your local guitar shop in search of fun stompboxy goodness. We’re in a golden era of boutique audio hardware creation, so there’s no better time to experiment with literally out-of-the-box noisemaking. Today’s sound is an extremely simple drum loop, but using a bunch of effect pedals, all managed through the Keymaster. First you’ll hear a rhythmic start with just a Dwarfcraft Robot Devil pedal, with only its starved circuit creating the rhythm, being run through a Red Panda Particle pedal set on delay. Then you’ll hear a hi-hat run through a Snazzy FX Wow and Flutter pedal. A dry kick drum then starts, and the snare eventually gets the Red Panda Particle treatment as a super-wet granular delay. It’s been an inordinately windy spring, even for the infamously windy San Francisco area. A previous post captured the sound of my fence swaying in heavy winds, and recently I discovered that my garage door not only creaks and groans in heavy winds, parts of it start vibrating.